Do you suffer with the Fear of Public Speaking? The fear of public speaking is often quoted as the number one fear for most people. So what is a fear of public speaking? Public speaking can include any form of public communication including, giving presentations to colleagues or customers, interviews, conducting meetings in a committee or team setting, talking in a group socially, giving a best man’s speech at a wedding. Whether it be 1 on 1, to small groups, or standing on stage addressing a large audience, even virtually on social media platforms, the fear of public speaking can occur in any environment that requires communicating in public. It doesn’t have to be that way, would you like to feel naturally comfortable and confident when communicating? Would you like to Improve Your Confidence and take control of the Fear of Public speaking? 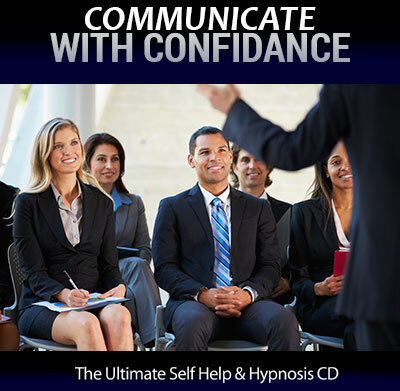 Communicate with Confidence and Clarity Audio programme. This Powerful, Relaxing, Self Hypnosis mind re-programming mp3 audio, is designed to help you re-programme your mind, to enhance your communication skills and improve your confidence when doing things like public speaking, giving presentations, speeches, interviews, conducting meetings, whether it be 1 on 1, to small groups or to large audiences. Imagine if, instead of trembling and turning to jelly, you could now communicate calmly, clearly with confidence, what positive impact will that have for you? Within the next few minutes you can be listening to the Communicate with Confidence audio program from the comfort of your home, computer or smart phone and re-programme your mind to feel calm, composed and confident when communicating. Are you ready to Communicate With Confidence and Clarity?